Robometricschool. 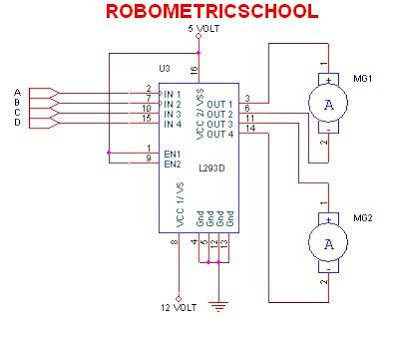 - As urgent part, when we want to design robot, driver DC motor can be designed using transistor, FET, and also using Integrated Circuit. One of IC that used to make DC motor driver is L293D as dual H-Bridge DC motor driver. 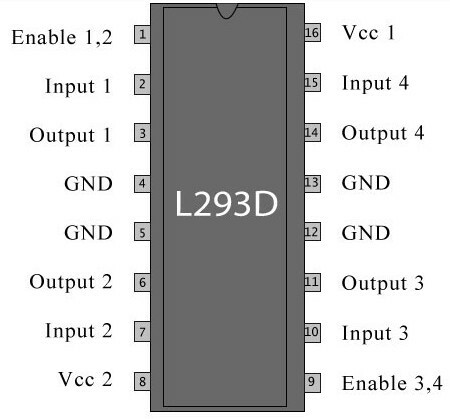 We can use L293D as dc motor driver because we know about L293D datasheet. 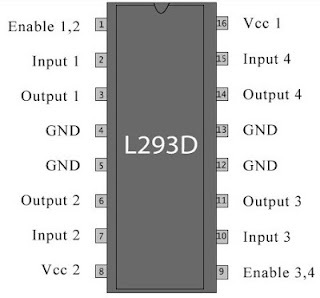 We know that L293D is L293D is a dual H-Bridge motor driver that consist of two dc motor driver. So with one IC we can interface two DC motors which can be controlled in both clockwise and counter clockwise direction and if you have motor with fix direction of motion the we can make use of all the four I/Os to connect up to four DC motors. From figure 3 above, we can make motor rotate clock wise when in input we give 1 logic in A and 0 logic in B. 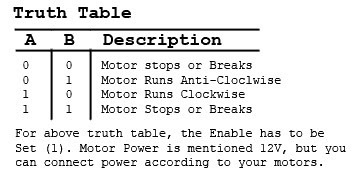 Also we can make motor rotate anti clock wise when input we give 0 logic in A and 1 logic in B. We can stop all motor with give in all input 1 logic. Attention you don't give in all input with 0 logic, because it can make L293D error or damage like burn or shot circuit. So careful when you set it.